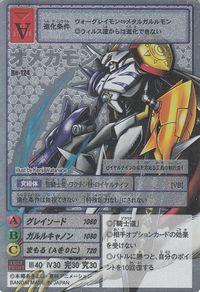 A Holy Knight Digimon born from the fusion of the Virus Busters War Greymon and Metal Garurumon due to the powerful wills of everyone who wished for good, and who is one of the "Royal Knights". 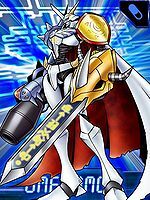 As a Digimon that combines the special qualities of the two, it is a multi-type warrior capable of fully demonstrating those abilities in any given situation. 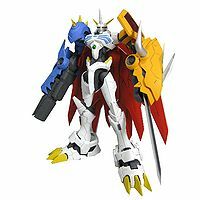 It is equipped with a sword and shield on its War Greymon-shaped left arm, and a cannon and missiles on its Metal Garurumon-shaped right arm. The cape on its back is automatically deployed when dodging an opponent's attack, or when it is flying. 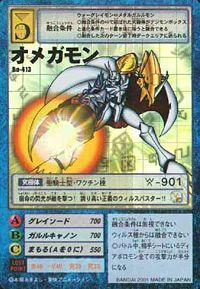 Its Special Move is freezing the opponent with frigid, absolute zero shots which it fires from the Metal Garurumon-shaped cannon (Garuru Cannon). 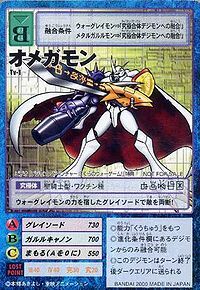 Also, its left arm is equipped with the invincible blade, "Grey Sword". This profile matches the one used on the Digimon Accel site. 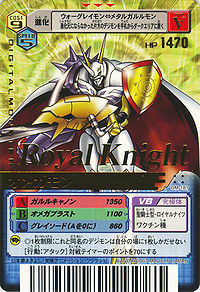 One of the Royal Knights who possess overwhelming power. 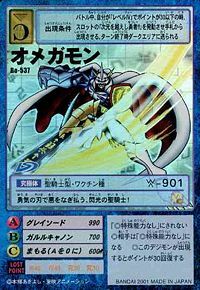 The offensive ability of its "Garuru Cannon" and "Grey Sword" is a destructive force that definitely surpasses that of an Ultimate. Title: 「伝説の戦士」 — "Legendary Warrior"
| Omega (Ω) 「オメガ」 is the last letter of the Greek alphabet. 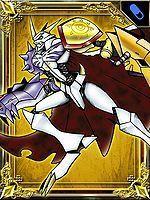 In conjunction with alpha from Alphamon, is a reference to the term "Alpha & Omega", an appellation of God mentioned in the Book of Revelation. 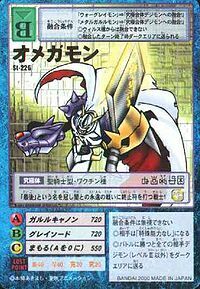 グレイソード Gurei Sōdo Transcendent Sword/Grey Sword The Grey Arm conceals an enchanted blade. 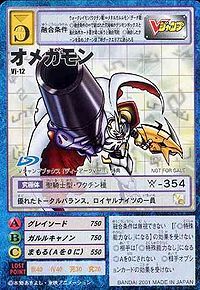 ガルルキャノン Garuru Kyanon Supreme Cannon/Garuru Cannon The Garuru Arm conceals a high-caliber cannon which fires explosive, absolute-zero energy. 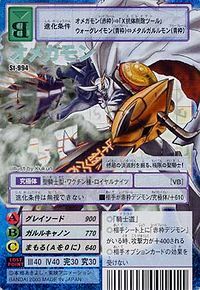 Uses the Grey Sword to send the enemy in the air then repeatedly blasts them with the Garuru Cannon. Strikes an explosive cross-slash with the Grey Sword. 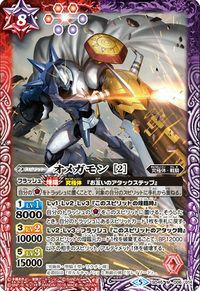 ダブルトレント Daburu Torento Double Shot/Double Trent Annihilates the opponent with successive ground waves of fire and ice from the War Greymon and Metal Garurumon heads. Attacks with the Grey Sword while dashing. A more powerful version of Grey Sword. 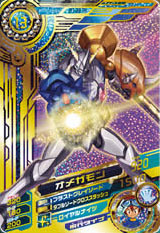 オメガブラスト Omega Burasuto Omni Blast Gathers light in the Grey Sword and swings it in the enemy's direction, engulfing them in a huge explosion or thunderbolt. 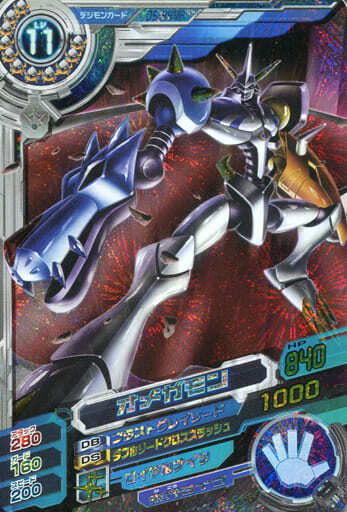 オメガハウリング Omega Hauringu Omni Howling Fires powerful sound waves or a homing swarm of icy energy from the Garuru Cannon. 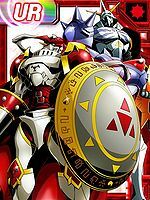 After War Greymon and Metal Garurumon are defeated by the multitude of Diablomon clones, Yagami Taichi and Ishida Yamato mysteriously enter their computers to try to revive their Digimon. In response to their partners, the battered Digimon begin to wake up. 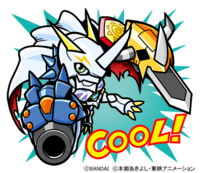 Using the power from the positive emotions of people watching the fight on the internet, War Greymon and Metal Garurumon fuse into Omegamon. 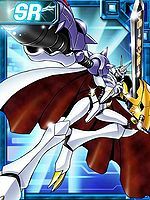 The Diablomon clones fire at Omegamon, but he deflects their attacks with the Grey Sword destroying a great number of the clones. He proceeds to slaughter more of the clones with the Garuru Cannon until only the original remains. 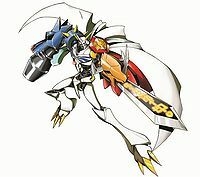 Koushirou forwards thousands of emails from children around the world to Diablomon to slow him down, during which Omegamon impales him on the Grey Sword. 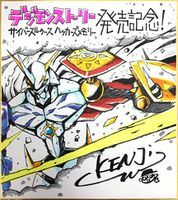 A random image of Omegamon appears during the explanation of Izumi Koushiro about how Jogress Evolution works. 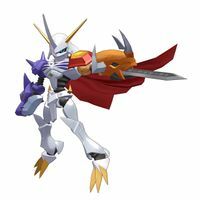 When Diablomon reappears on the internet, Omegamon returns. With the help of Angemon and Angewomon, he makes short work of the menace. 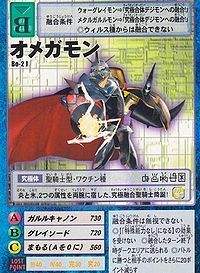 When the Kuramon in the real world fuse into Armagemon, it becomes clear that Diablomon's return was only a diversion. 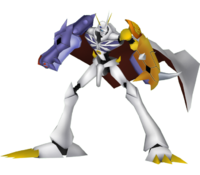 Omegamon appears in the Real World, but is no match for his opponent. 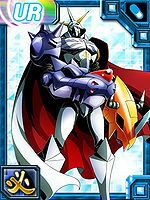 Armagemon badly injures Omegamon, causing both of his arms to fall off. 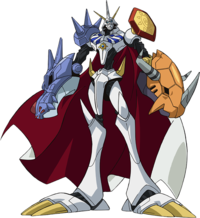 Later, Omegamon gives his power to a beaten and weakened Imperialdramon Fighter Mode to mode change him into Paladin Mode, while Omegamon reverts to Agumon and Gabumon. 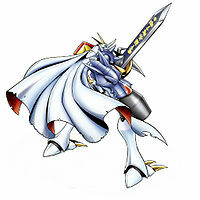 An Omegamon hunts Mephismon (born from the remains of an Apocalymon), who escapes to the Tamers' Universe. He aids Ruki and Jenrya in reaching the VP Laboratories to fight Mephismon. 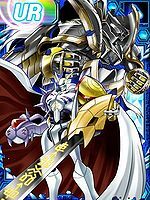 This seems to be the largest Omegamon in terms of size, compared to that of the Omegamon from the Adventure series judging by the size when traveling with Ruki and Jenrya. 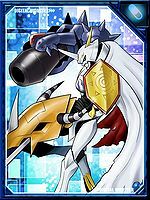 Following Yggdrasil's orders, Omegamon attempts to execute all X-Antibody Digimon. 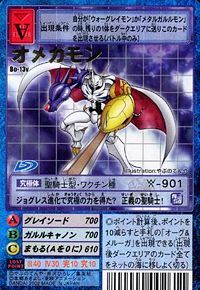 When his friend Dukemon attempts to stop it, the two duel. 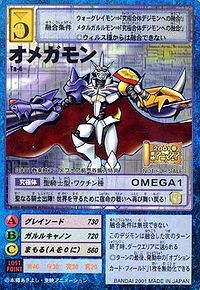 Omegamon is the victor, impaling Dukemon through the chest with the Grey Sword. 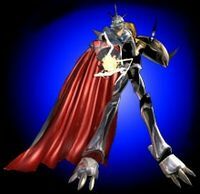 Afterwards, a shadow of doubt and regret casts itself over Omegamon. 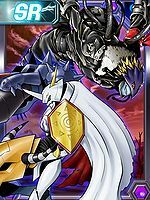 When DORUguremon arrives in the Yggdrasill zone to take down Yggdrasill, Omegamon confronts it and the two begin to battle, although Omegamon no longer seems certain as to what he's fighting for. 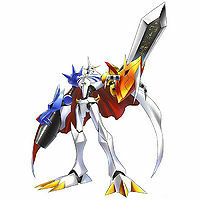 Omegamon wins, inflicting heavy wounds on his opponent, including cutting off his wings. 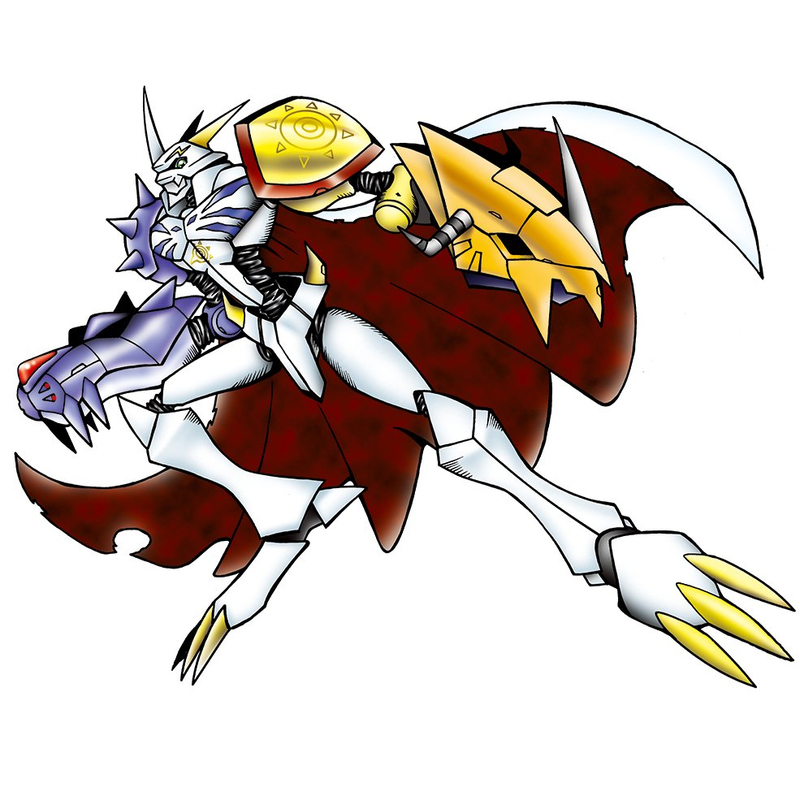 DORUguremon evolves into Alphamon, and Omegamon immediately submits to his lord. Together, the two move onward toward Yggdrasil. 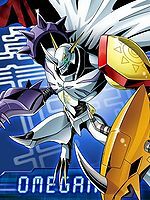 When they reach Yggdrasil's last guardian, Death-X-DORUgoramon, Omegamon is powerless and Alphamon defeats it, onward, they both encounter Death-X-mon, Alphamon: Ouryuken sacrifices himself to clear the path to Yggdrasil. 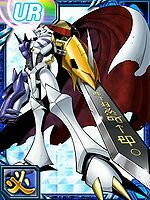 In an ironic twist, Omegamon absorbs Alphamon's X-Antibody and evolves into Omegamon X-Antibody. 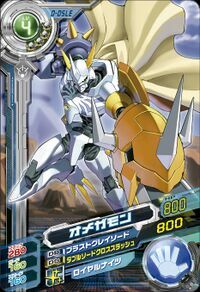 Angrily, Omegamon falls upon Yggdrasil's core, shouting "All Delete!" as he skewers the crystal ball-like structure with the Grey Sword. 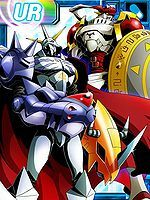 As the movie ends, Omegamon X and Dukemon X are shown standing on a mountain, discussing the past, present, and future of the world, Yggdrasill, and the Royal Knights. 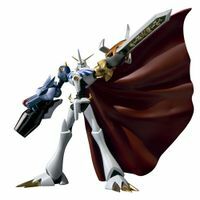 Omegamon is one of the Royal Knights. 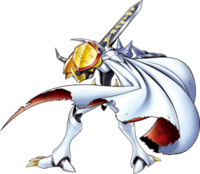 Omegamon was the leader of the Legendary Digimon who were turned into DigiMemories when they tried to prevent the Digital World from crumpling. He was thrown into the human world, where he eventually gave Kudou Taiki his Xros Loader and sent him to the Digital World. He appears again in A New Journey!! The Great Tokyo Showdown! !, where he helped Shoutmon to evolve into Omega Shoutmon and sent Taiki back to the Digital World. 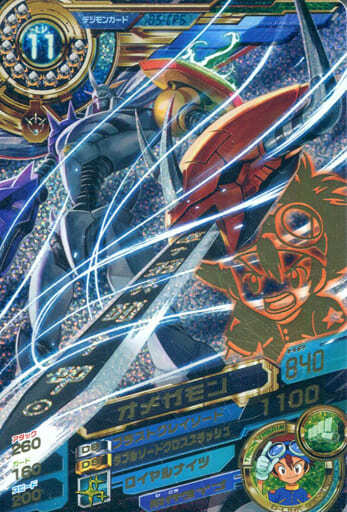 He makes his last appearance, as a DigiMemory, in Glorious DigiXros, Seize it! Our Future!!. In "Resemblance? Or None at All? 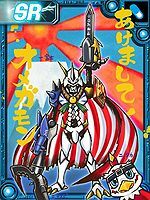 The Disguised Phantom Thief Betsumon", Betsumon is shown masquerading as him. Later in "The Gathering of the Legendary Heroes! The Digimon All-star Showdown!! 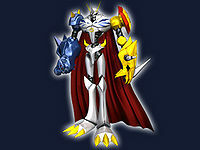 ", Yagami Taichi and Ishida Yamato fuse their Digimon into Omegamon in order to fight Quartzmon. 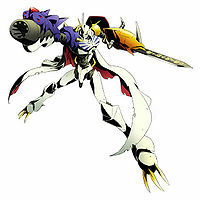 An Omegamon is the partner of Hideto, one of the Alias III. 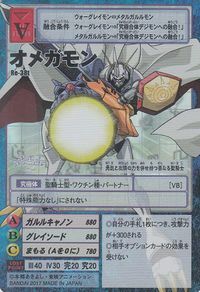 He appears when Death-X-DORUgoramon was overdriving. 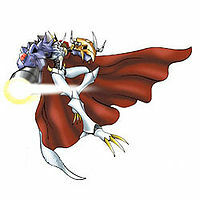 Then after DORUmon got the new dragon Spirit, he found that Death-X-mon was revived by Metal Phantomon. He battled them and got seriously injured. 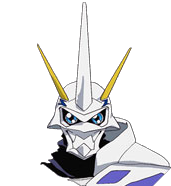 Omegamon was one of the Royal Knights. At the time the story takes place, it is belived he is dead. 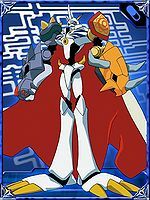 Shoutmon is said to possess the same aura as Omegamon. 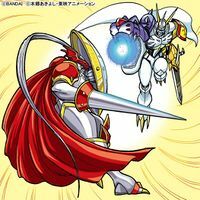 In a flashback, Omegamon was shown fighting Bagramon and Tactimon at Yggdrasill's stem. 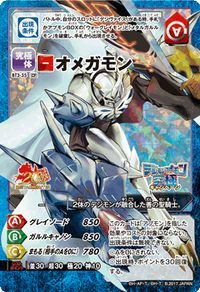 Omegamon evolves from Metal Greymon (20+ DP). His skill, Grey Sword, costs 38 MP and is a single-enemy attack. 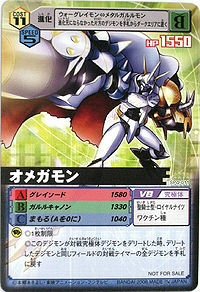 Omegamon is the last opponent in Sage Tower's last Battle Arena. 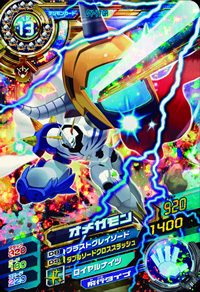 He has 2 cards in the game: Omegamon I (Red) and Omegamon II (Blue), which may be obtained by fusing the cards of War Greymon and Metal Garurumon or Metal Greymon (Vaccine) and Were Garurumon, respectively. 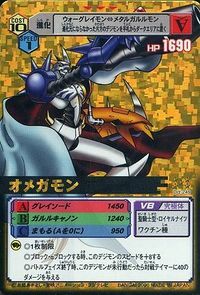 Omegamon can be obtained by evolving either Gabumon or the Extra Agumon. 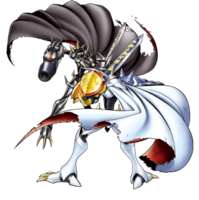 Omegamon can be unlocked as a playable character. 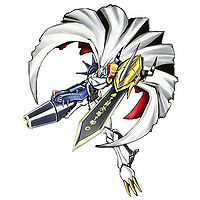 Omegamon is one of the bosses of the game. 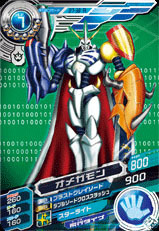 As an obtainable Digimon, evolves from War Greymon or Metal Garurumon by Card Evolution. It may also evolve if both are at Level 51 or more through an event. 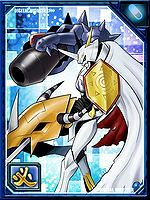 Omegamon is an obtainable Digimon. 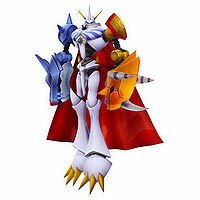 Omegamon is the first boss character. 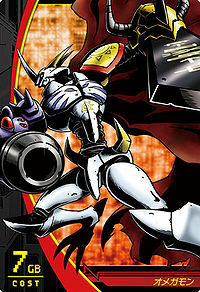 Omegamon appears as one of the five boss Digimon in this game, and is third hardest in terms of difficulty. 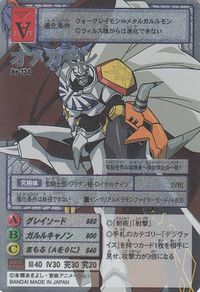 He is a very well balanced fighter boasting excellent fire power, and good strength. He is unlocked when is defeated in the Chaos Wasteland. 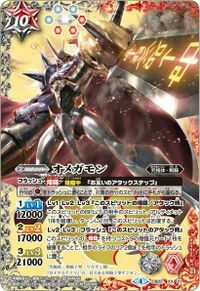 Can be evolved from Metal Greymon if above level 62 and if the player has already befriended another Omegamon. He also gives a request mission to sharpen his Grey Sword at Lava River. 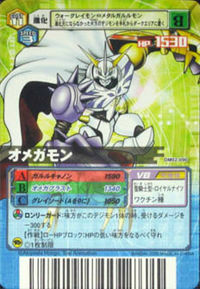 He can be befriended by hatching a DigiTama made by matching a Metal Garurumon and War Greymon when both over level 60. 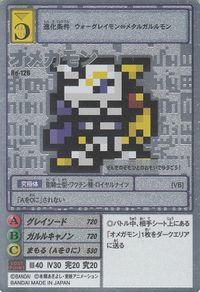 He is a obtainable evolution of Agumon. Can be Jogressed from War Greymon and Metal Garurumon if they are at least level 65, speed 415, and friendship 100%. 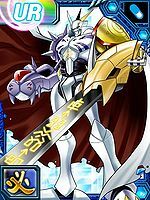 An NPC Omegamon can be seen at the Center Bridge, but another Omegamon also appeared as one of the members of Gaia Origin, challenging the player alongside Alphamon during the Quest Mission "The Challenge From Gaia Origin!". 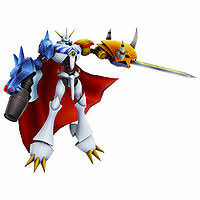 Omegamon is an obtainable Digimon which is Jogressed from War Greymon and Metal Garurumon. It can also be obtained as a collectible card. 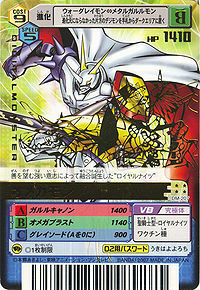 Its card is part of the Royal Knights: Founder (ロイヤルナイツ：始祖 Roiyaru Naitsu: Shiso) set. 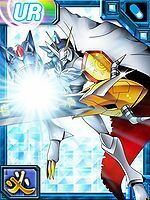 Omegamon is an unlockable Super Form which can evolve from Agumon or Gabumon. It can also be obtained as a collectible DigiCard. 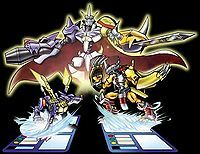 There are four versions of Omegamon. They evolve into each other. 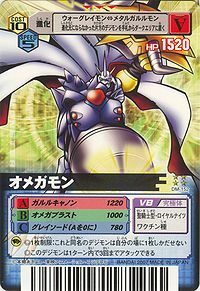 Obtainable by Jogressing Holy Angemon or Angewomon with a compatible Digimon. 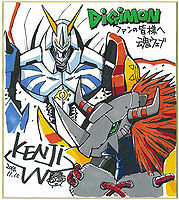 Can also be obtained by Jogressing War Greymon with Metal Garurumon. 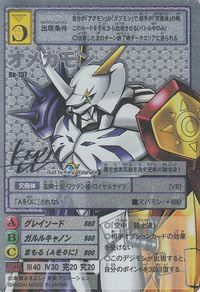 Omegamon can be obtained as a Battle Evolution by winning with Metal Garurumon X-Antibody against War Greymon (PenProg1). 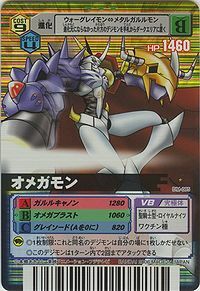 Evolves from War Greymon after battling 100 times or more. 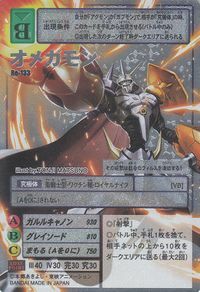 Bearing the name "Omega", it is a warrior who puts an end to the eternal battle against the darkness! 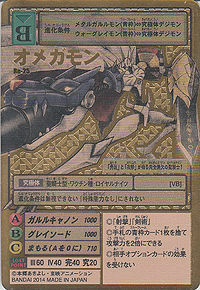 With its dragon sword of Courage and its beast cannon of Friendship, it is able to overcome all odds! 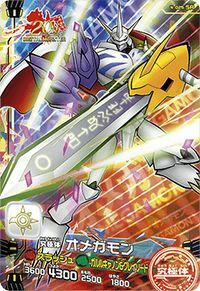 It wields the finishing sword of destruction, a holy knight who has reached its limits! This multi-type fighter was born from the strong good intentions on the Net! It destroys enemies with the light of fate! A proud Virus Buster of justice!! It mows evil down with its blade of courage, the holy knight of light! 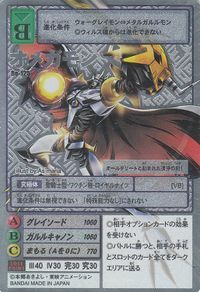 This Royal Knight of extermination protects Yggdrasil's justice! It attained ultimate power through Jogress Evolution? A holy knight of justice! With the attributes of fire and ice in each hand, the ultimate fused Holy Warrior is born! The holy knight departs for the front! To protect the world, it returns to the fated battle once again! 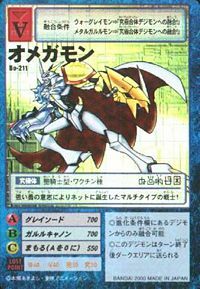 It bisects its enemies with the power of War Greymon that dwells within its Grey Sword! 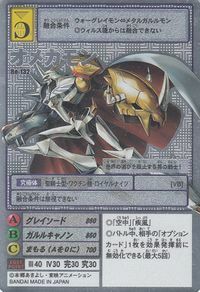 A member of the Royal Knights, it excels in total balance. 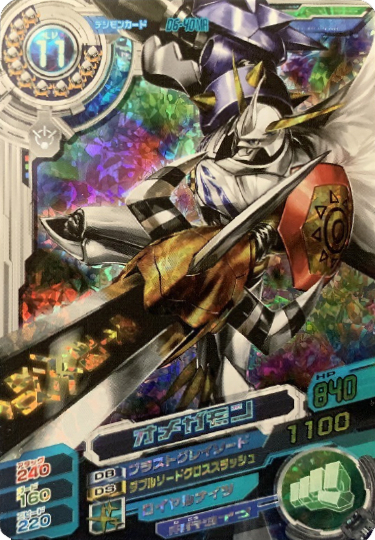 Courage' and 'Friendship' dwell within this Holy Knight who boasts absolute perfection! In response to the prayers of the people, this benevolent being was born from the fusion of courage and friendship! It aims and fires its absolute-zero cannon with remarkable accuracy! The enforcer of justice who seeks to elevate the Royal Knights' name to greater heights! The words "All Delete" are carved onto its blade of purification! The righteous thoughts of the people brought about its fusion! A Holy Knight bearing the characteristics of its two components is born! This virtuous warrior prevents the destruction of the world! A blast from its cannon freezes hordes of viruses in their tracks! It forcefully terminates any and all who try to destroy the Digital World with one strike! This fused being turns the tides, stamping out evil and bringing about justice! 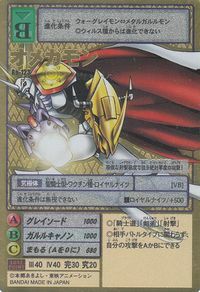 This virtuous Holy Knight wields both the powers of courage and friendship. 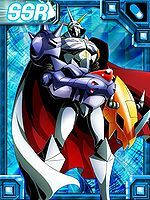 A "Royal Knight" born from a fusion that occurred due to the powerful wills of those who wished for good. 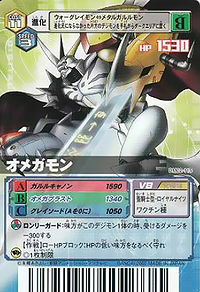 A holy knight Digimon who wields the giant "Garuru Cannon" on its right arm, and the invincible "Grey Sword" on its left. 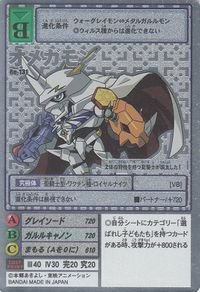 A Holy Knight Digimon who is a member of the Royal Knights. It was born from the strong hearts of people who wished for good. Yagami Taichi's strongest partner. The people's hopes and wishes for the world to be saved turned to power and gave rise to this Digimon. The cape on its back is automatically equipped whenever it needs to be used. A multi-type warrior who can display its abilities no matter the situation. It was originally a member of an order of knights that protected the Digital World. When the world split apart, it was sealed into a Digimemory and fell into the human world. 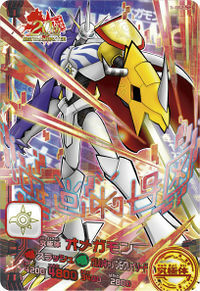 It is able to exhibit many different kinds of powers, even when sealed as a Digimemory. 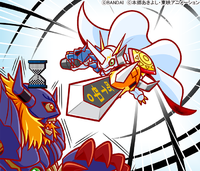 Omegamon's true power knows no limits. A knight that once protected the Digital World. It entrusted its wishes for peace to be returned to Taiki and his friends. 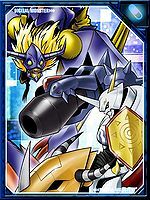 The jogress evolved form of War Greymon and Metal Garurumon. It possesses a peace-loving heart of justice and overwhelming power. 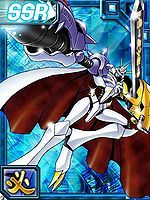 A Holy Knight Digimon that was born from a miraculous fusion, brought about by the wills of the people who wished for good. 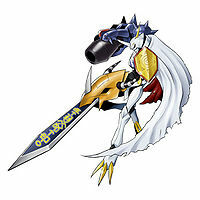 It is an all-rounder capable of wielding its weapons, which have the powers of 2 Digimon within them, at will. 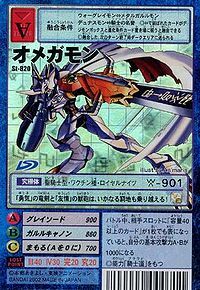 This virtuous Holy Knight was fused from two Digimon. 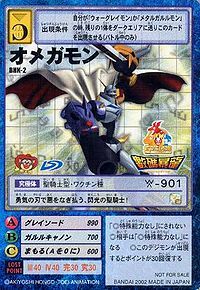 A Super Ultimate-class Holy Knight Digimon, formed from the fusion of War Greymon and Metal Garurumon. This Holy Knight brings an end to the battle against evil. 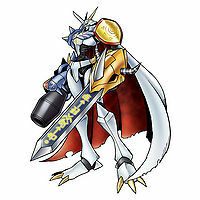 An Ultimate level Holy Knight Digimon resulting from the fusion of War Greymon and Metal Garurumon. It was born from the strong wishes of the people who hoped for peace. 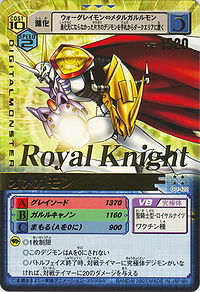 A Holy Knight Digimon who is a member of the "Royal Knights". 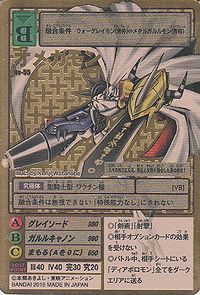 Its Special Moves are "Garuru Cannon", and its invincible blade "Grey Sword". 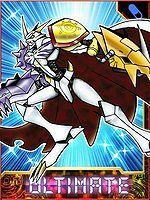 Omegamon can be summoned in the Arcade component of the game by a special 20th Anniversary card. 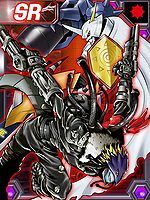 Digital Monster X-evolution Digimon Adventure tri. Digimon Adventure tri. ↑ Digimon Adventure tri. 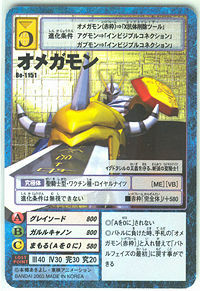 - "Our Future"
↑ This Agumon is known as Extra Agumon, a special version with a floating ability. This page was last modified on 25 April 2019, at 10:20.